Presenting the eVic VT 60W, to go with eGo ONE Mega VT atomizer , with its new cutting edge technology of temperature control, embodies the concept of a healthy alternative lifestyle. eVic-VT features a super large OLED screen, supporting VT-Ti (Titanium)/ VT-Ni (Nickel)/ VW mode, and battery capacity of 5000mah. The Variable Temperature (VT) brings out a different flavor experience with the change of temperature settings, not only improving the taste,but also saving battery and liquid consumption. 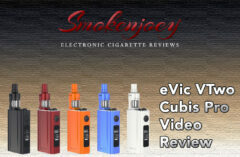 eVic VT is not your typical vape, it’s an evolutionary start. Nickel 200 (Ni,Made in USA) and Titanium (Ti) wires, applied with eGo ONE Mega atomizer, greatly enhance the performance of eVic-VT.